Well, dear reader, if you are a regular here (and why wouldn’t you be?) you will know of my warm and close relationship with pies. It’s no surprise therefore that I am delighted to have in my warm and still-pie-crumbed hand a book which is filled with nothing but pie. Janet Clarkson is the author of this fine little tome and she is a GP and lecturer in the School of Medicine at the University of Queensland, Australia. That might give the impression that pies are dodgy and dangerous things to eat! 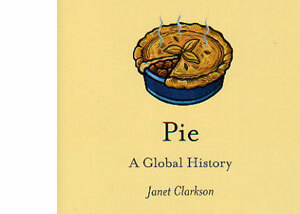 Janet has a passion for food history and she writes often on that subject… and pies are safe to eat, at least these days. Pie is one of the few culinary triumphs to have emanated from Britain. Its traditions have spread throughout its colonies and are now adapted as national specialities in the USA (fruit pies), in Australia (meat pies in mushy peas), and New Zealand (mutton pies). They have been the staple of both rich and poor and they have travelled well. Pie – A Global History is one of a series of food history books from Reaktion. Each one has a different author and covers a different food but they all have the same high standard of presentation and content. This, like the others, is not a recipe book (although there are several) but it quite definitely is a book that is fascinating for both domestic foodies and food academics. It’s thoroughly well researched and Janet has a humorous and accessible style. The illustrations are quite charming and range from medieval sketches to stills from the 2007 film of Sweeny Todd, the story of which is enough to turn anyone from the pie path. I expected this book to be a good read and it does not disappoint. It would be a great gift for any lover of food, food history or history in general. 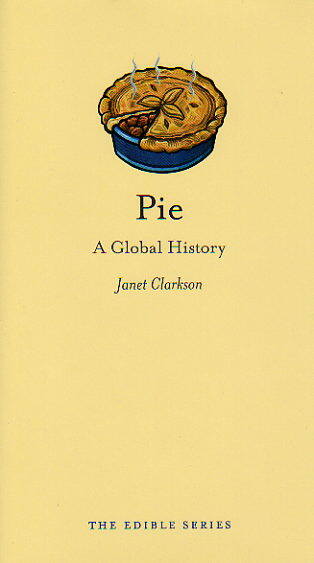 Pie – A Global History is an attractive volume and a worthwhile addition to any serious book collection.